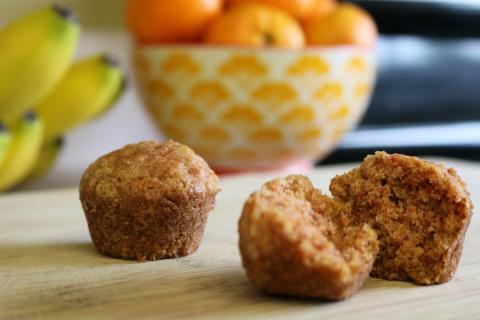 These flavorful muffins are a great way to get your kids (and yourself!) to eat more vegetables without even noticing it! Drain carrots of salty liquid and pour onto a dinner-sized plate. Mash with a fork until all pieces of carrot are about the size of peas. Put mashed carrots in a medium-size mixing bowl. Break egg into a separate small bowl and mix well with a fork. Add oil to egg and mix well. Add oil/egg mixture to carrots. In a separate bowl, stir together flour, baking soda, and salt. Add flour mixture to carrot mixture and stir until moist. Pour batter into muffin tins sprayed with nonstick spray or lined – about half full. Bake 25-30 minutes. (To make 24 mini muffins, bake for about 20 minutes.) Test center of one muffin with a toothpick. If it comes out clean, the muffins are done. Cool 5 minutes. Best served warm.